Many golf courses in Western Europe have had significantly higher rainfalls than is usual for this time of year. This has raised the subject of how players should proceed when their ball lies in water-filled bunkers. Here is a question I received two weeks ago from a Committee member of a Club close to where I live in South Dublin. Q. May a Committee make a Local Rule allowing a player to drop out of any bunker filled with casual water, without penalty, contrary to Rule 25-1b(ii)? A. No. The Committee may not make a Local Rule providing generally that flooded bunkers are ground under repair through the green as such a Local Rule waives a penalty imposed by the Rules of Golf, contrary to Rule 33-8b. "Q. If a player's ball lies in a bunker completely covered by casual water, what are his options? Note that the second option above incurs a penalty of one stroke and the ball must be dropped outside the bunker, keeping the point where the ball lay in the water in the bunker directly between the hole and the spot on which the ball is dropped, with no limit to how far behind the bunker the ball may be dropped. "If a bunker is being renovated and the Committee defines the entire bunker as ground under repair, the bunker loses its status as a hazard and is automatically classified as ‘through the green’. Therefore, unless a Committee specifically states otherwise, Rule 25–1b(i) applies, not Rule 25–1b(ii). (Revised)"
Please pass this blog entry along to your Club Committee if they are having a problem as to how to deal with waterlogged bunkers. Author of ‘999 Questions on the Rules of Golf'. Click here for special Christmas gift offer. Great piece - thanks for all the help. 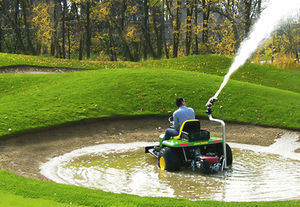 When you take a drop from casual water in a bunker are you permitted to clean the ball? If not, what is the penalty for cleaning the ball. Yes, you are permitted to clean the ball in this circumstance without penalty. However, remember that you must drop the ball in the bunker without penalty in accordance with Rule 25-1b(ii)(a), or outside the bunker under penalty of one stroke in accordance with Rule 25-1b(ii)(b). A question again on bunkers!!! All the bunkers on a course have been declared out of play for a competition. There were no penalties incurred when removing the ball from the bunkers. Is the competion stil a 'Qualifying' competition?? No! As should be clear from this blog, a Committee is not permitted to take all bunkers out of play, because the Rules of Golf deal comprehensively with options for players when bunkers contain casual water. As this is not permitted, the competition is not being run under the Rules of Golf and cannot count for handicapping purposes.